Spike`s CO2 gas manifold is designed to attach directly to the 1.5" tri-clamp port on your fermenter`s lid. 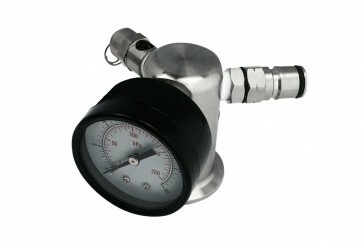 This manifold allows you to easily add pressure for transfers, stuck yeast dumps, purging oxygen, carbonating, etc. The manifold has 3 ports for a pressure gauge, pressure releif valve and a ball lock gas post. One part, three functions, easy assembly, easy cleaning.